NEW YORK — Countless New Yorkers and visitors have warmed their hands on it — a blue, white and gold cardboard cup with an ancient Grecian design, steaming with coffee or tea. This pop-culture emblem of New York is slowly disappearing. And now the man who created it is gone. Leslie Buck died on Monday at his home in Glen Cove, Long Island, at age 87. He succumbed to complications from Parkinson’s disease, said his son, Robert Buck, who for years worked alongside him at a Connecticut cup-making company. Starting in the 1960s, the Holocaust survivor from Eastern Europe decorated his creation with Greek urns, images of coffee cups and the phrase "We Are Happy To Serve You" in a font resembling ancient Greek. 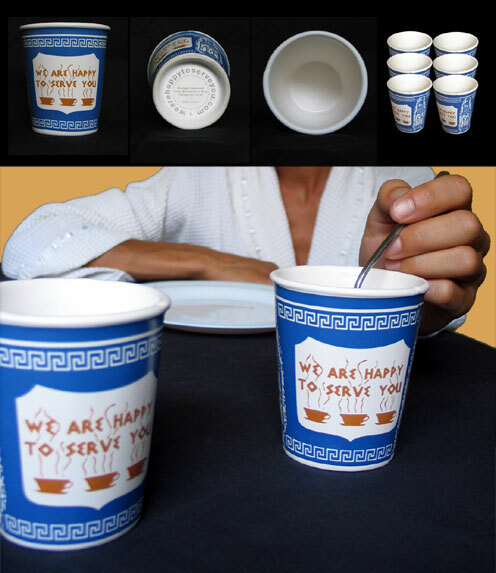 The new product, made by the Sherri Cup Co. of Kensington, Connecticut, was aimed at urban diners owned by Greek immigrants who were, in fact, happy to serve customers sipping from hundreds of millions of the cups over the decades. The design soon spilled into the streets, used by vendors peddling coffee on chilly days. Leslie Buck called it the "Anthora" — unable to quite pronounce "amphora" (or urn) in his accented English. He was born Laszlo Buch in Khust, Czechoslovakia — now part of Ukraine. He survived Auschwitz and Buchenwald, leaving Europe after his parents died in the Holocaust. In New York, with an Americanized name — Leslie Buck — he went into business, starting a paper-cup manufacturing company called Premier Cup in Mount Vernon, New York. In the 1960s, Buck joined Sherri Cup Co., which by the early 1990s was selling 30 million pieces a year of the cup designed by an artistically untrained immigrant, said Robert Buck. The classic cups became standard props in films set in New York and television shows such as "Law & Order" and are regularly seen in movies filmed in NYC. The "Anthora" is still around in many New York diners, delis and an occasional food cart . BELLA Main Street Market in Baker City, OR and the new BELLA in La Grande, OR both feature the classic cup in a ceramic version. It's a little piece of New York, and a great tribute to a creative man who lived his American dream!